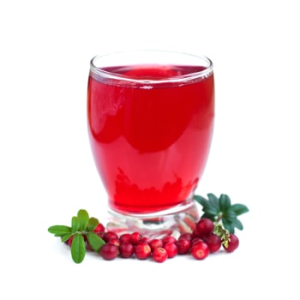 Home › General Wellness › Is Cranberry the Best Natural Solution for UTIs? Urinary tract infections (UTIs) affect 1 in 2 women, over the course of their lifetimes and can even affect men as well. Many people have heard that the best way to treat a urinary tract infection is to drink cranberry juice. Is this effective, or is it just a myth? Is cranberry juice the best way to get what works for UTIs, or is there a better solution? For many years, antibiotics were seen as the perfect solution to UTIs. Although antibiotics can be useful, and necessary for some conditions, it is best to avoid using them whenever an alternative exists. We now know the important difference between “good” bacteria and “bad” bacteria, and need to remember that commonly prescribed antibiotics for UTIs can result in a massive reduction of all of our body’s bacteria and leads to a decline in our gut health as well. Fortunately there’s a natural option hat saves us from the unwanted side effects of taking antibiotics: supplementing with d-mannose. Where can we find the best natural source of d-mannose? Cranberries. WHY D-MANNOSE SUPPLEMENTS OVER CRANBERRY JUICE? D-mannose is one of the sugars naturally found not only in cranberries, but in pineapples, blueberries, peaches, and apples as well. Most people are unaware that d-mannose is the specific component of cranberry juice that works for UTIs and that it can be isolated and taken as a supplement. The main reason that d-mannose supplements are superior to cranberry juice is because they come with fewer side effects. In comparison, using cranberry juice as a way to get d-mannose loads the body up with excess fructose sugar. Fructose is a simple sugar that can lead to health problems like obesity and cardiovascular and metabolic disease, according to the American Journal of Clinical Nutrition. Further, many bottlers of cranberry juice add additional fructose to make the drink sugary and taste good. D-mannose is a much better sugar to put into the body because, unlike fructose, it does not convert to glycogen or get stored in the liver. D-mannose is a fairly unique sugar since only very small amounts are metabolized. This makes d-mannose great for those who are interested in the urinary tract health-boosting benefits of cranberries, but don’t want the blood sugar spikes and extra calories that come with cranberry juice. What makes d-mannose so effective is that it acts like a magnet for the bacteria E. coli, which is the cause of the vast majority of UTI cases. More than 90 percent of UTIs are caused by E. coli that makes its way from the intestinal tract to the urinary tract. When enough E. coli gets to the urinary tract, it can multiply and cause the typical symptoms of a UTI (pain, nausea, and urination difficulties). In theory, our urine can flush out bacteria like E. coli that gets where it shouldn’t be. The problem is that E. coli clings to the walls of the bladder using finger-like adhesives called fimbriae. These fimbriae act like hooks that keep the bacteria firmly in place and, as a result, urine alone is unable to remove the bacteria. The reason that E.coli sticks to the walls of the bladder is because the internal lining of our urinary organs are covered in sticky mannose. This is the same mannose that is found in d-mannose supplements and cranberries. When we consume mannose supplements or cranberry, we add extra mannose to our body that does more than just stick to our urinary lining. Just like with many vitamins, when our bodies have more d-mannose than we need, we pass it through our urine. In this case, this excess mannose adheres to the E. coli bacteria fimbriae in the urinary tract and the E.coli then has difficulty staying attached to the bladder walls and gets flushed out. Fortunately, the case for the effectiveness of d-mannose and cranberry goes beyond biological theory. Many studies that have been published in reputable, peer-reviewed scientific journals verify d-mannose’s effectiveness. For instance, a study published in the journal Drugs verifies that cranberry-based products appear to work by inhibiting the adhesion of E. coli to the inner lining of the bladder, thus impairing colonization and subsequent infection. The study supports the potential use of cranberry products for the prevention of recurrent UTIs in young and middle-aged women, but warns about weight gain due to the excessive calorie load of juice. D-mannose supplementation, instead of consuming cranberry juice, eliminates this concern. The Canadian Journal of Microbiology also published an interesting study that found that even UTIs caused by the bacteria P. mirabilis, instead of E. coli (which can happen in people with functional or structural abnormalities or with long-term catheterization), are effectively treated with mannose-containing cranberry items. According to the study, cranberry and its d-mannose reduce P. mirabilis’ ability to cause disease and serious harm by reducing the production of the enzyme that contributes to the increase in severity of infections. A study from the journal Colloids and Surfaces B: Biointerfaces seems to confirm the findings of the Canadian Journal of Microbiology. This study also looked at UTIs caused by P. mirabilis and found that cranberry-enriched molecules significantly impaired the bacteria’s ability to spread. When the bacteria are unable to spread, the infection is kept in check and is easier to treat and remove. The study’s results are exciting to the medical community because they seem to point to the potential use of cranberry derivatives, such as d-mannose supplements, to hinder the spread of germs in implantable medical devices such as catheters, which are often implicated in UTIs. Some people may have infrequent UTIs and simply want to take preventative measures to ensure that their urinary tract stays healthy and functional. Fortunately, studies shows that cranberry and d-mannose work great for this purpose as well. A study from World Journal of Urology found that d-mannose powder significantly reduces the risk of recurrent UTI. The patients who received d-mannose in the study had a significantly lower risk of recurrent UTIs during d-mannose preventative therapy than those who did not supplement with d-mannose. Research suggests there seems to be more to cranberries than just d-mannose. 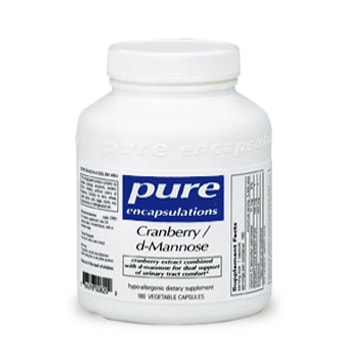 For this reason, I like Cranberry/d-Mannose by Pure Encapsulations because it combines cranberry extract made from 100% cranberry fruit solids and d-mannose for dual, concentrated support of urinary tract health that removes even the most stubborn bacteria. U-Tract Complex is also a good choice. It not only contains d-mannose, but also a unique combination of other helpful natural ingredients such as Swedish pollen extract, white willow bark extract, and cratavin. Cranberry extract provides urinary tract support without the unwanted sugar found in cranberry juice or juice cocktails, which can encourage the growth of unfriendly bacteria. It enhances the acidity of urine and maintains a healthy urinary tract ecology. Urinary tract infections (UTIs) affect 1 in 2 women, over the course of their lifetimes and can even affect men as well. Many people have heard that the best way to treat a urinary tract infection is to drink cranberry juice. Is this effective, or is it just a myth? For many years, antibiotics were seen as the perfect solution to UTIs. Fortunately, a great, natural UTI solution saves us from the unwanted side effects of taking antibiotics: supplementing with d-mannose. D-mannose supplements are both a highly-effective way to cure UTIs and a useful preventative tool for maintaining good urinary tract health. Where can we find the best natural source of d-mannose? Cranberries. D-mannose is one of the sugars naturally found not only in cranberries, but in pineapples, blueberries, peaches, and apples as well. Most people are unaware that d-mannose is the specific component of cranberry juice that works for UTIs and that it can be isolated and taken as a supplement. The main reason that d-mannose supplements are superior to cranberry juice is because they come with little to no side effects. In comparison, using cranberry juice as a way to get d-mannose loads the body up with excess fructose sugar. Fructose is a simple sugar that can lead to health problems like obesity and cardiovascular and metabolic disease. More than 90 percent of UTIs are caused by E. coli that makes its way from the intestinal tract to the urinary tract. When enough E. coli gets to the urinary tract, it can multiply and cause the typical symptoms of a UTI (pain, nausea, and urination difficulties). The problem is that E. coli clings to the walls of the bladder using finger-like adhesives called fimbriae. These fimbriae act like hooks that keep the bacteria firmly in place and, as a result, urine alone is unable to remove the bacteria. The reason that E.coli sticks to the walls of the bladder is because the internal lining of our urinary organs are covered in sticky mannose. This is the same mannose that is found in d-mannose supplements and cranberries. When we consume mannose supplements or cranberry, we add extra mannose to our body that does more than just stick to our urinary lining. Just like with many vitamins, when our bodies have more d-mannose than we need, we pass it through our urine. In this case, this excess mannose adheres to the E. coli bacteria fimbriae in the urinary tract and the E.coli is no longer able to stay attached to the bladder walls and gets flushed out. Fortunately, the case for the effectiveness of d-mannose and cranberry goes beyond biological theory. Many studies that have been published in reputable, peer-reviewed scientific journals verify d-mannose’s effectiveness. Some people may have infrequent UTIs and simply want to take preventative measures to ensure that their urinary tract stays healthy and functional. Fortunately, studies shows that cranberry and d-mannose work great for this purpose as well. For those looking for comprehensive urinary tract support that goes beyond just UTI prevention, I recommend looking at UTI-Max by BioGenesis. UTI-Max is great for preventing UTIs , due to its inclusion of d-mannose and cranberry extract, but also includes antioxidants, antimicrobials and botanicals that are designed to reduce inflammation, promote healing, displace and kill pathogens, and support the repair of the entire urinary system.